My passion has always been in building productivity apps for consumers and small businesses. The productivity space is a tough one though with thousands of applications but very few breakout success stories. While many apps promise significant improvements in productivity, they often still fail to gain any meaningful traction. At the same time certain applications do succeed and I’ve tried to discern what sets these applications apart from the numerous failures. I’ve concluded that for productivity applications, success comes down to the following value equation: the productivity gain from using the app must exceed the cost of the constraints imposed by it. In terms of the productivity gain, most applications have clearly understood productivity benefits over alternative solutions. But sometimes these benefits aren’t compelling enough to warrant continued usage of the application. The goal has to be to create a 10x productivity improvement over the alternative solution since habits are difficult to change and only such a dramatic improvement will warrant users changing their behavior. Many applications fail to deliver on this required level of productivity benefits and thus find it difficult to retain users over time. The more difficult part of the equation, however, is the cost of the constraints imposed by the application. Even when an application does deliver significant productivity benefits, it may still fail due to the constraints it imposes. What I mean by this is prior to adopting your solution, a user had an alternative means of accomplishing the same task. And while they may have not been using a sophisticated application to accomplish the task, the simplicity, flexibility, and speed of the alternative solution often trumps the value that the new application delivers. And when they attempt to leverage the application, they may find that simplicity, flexibility, speed, or some other important attribute of their existing solution has been sacrificed. These constraints often prevent users from incorporating the new application into their routine. 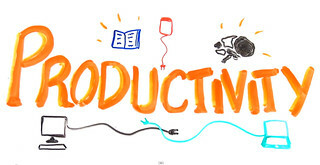 Let’s make this concrete by taking a look at a specific productivity space, some of the common benefits and constraints imposed by applications in this space, and an example of an application that is successfully delivering on the productivity app value equation. One of the most popular categories of productivity apps are note taking applications. The productivity benefits these applications provide include fast search across all notes, easy categorization of notes by tag, and more. It’s clear to most the value of consolidating all of their notes into one easily searchable index. While these applications are certainly not new, only recently has an application in this space gotten much traction. Namely Evernote has become a breakout success in note taking and productivity applications in general. To understand Evernote’s success, we need to start with understanding the alternative solution that remains still more popular than any application to date: a simple pen and notebook. Nothing trumps the notebook in terms of flexibility. You can capture meeting notes, to do lists, wireframes, and free form drawings. You can even stuff a photo or a printout into your notebook as well. Similarly, notebooks are easy enough to carry with you everywhere you go. Most previous note taking applications could not easily replicate the flexibility, speed, and everywhere access that a simple notebook or pad of paper provides. What Evernote was able to do is finally significantly reduce these key constraints. First, it enabled the ability to easily capture any note type: meeting notes, task lists, web pages, voice notes, photos, PDFs, mobile phone images, and much more. By supporting practically any form of note you wish to take, they were able to emulate the flexibility of a notebook. Second, Evernote ensured their application was available everywhere you wanted it. With the advent of smartphone applications, Evernote finally became available in your pocket, making it in some ways even more convenient than a notebook. Similarly, they have desktop applications (with offline access), a robust web application, browser plugins, and support across many different platforms to ensure it’s truly available wherever you want it. By getting past the constraints typically imposed by note taking applications, Evernote was able to gain traction well beyond that of previous applications. Of course there’s lots more to Evernote’s success than this, but it illustrates the importance of productivity apps ensuring their productivity gains far exceed the cost of the constraints they impose.